The Dani J Way – Build a bridge. Tell a story. Make a friend. Be Magnetic. Sing. Thrive. Win. Smile because you can. Choose to Love. Shine. In 2013, Leo Burnett learned that it would take 66 years to achieve true equality in the advertising industry. At the 2014 ADCOLOR Awards & Conference, Leo Burnett encouraged the industry to say No2Six6. Produced ADCOLOR No2Six6 Event & After Party, including promotional materials and swagg. I had a blast supporting Chicago Recording Company’s Rock & Shop and I was ecstatic that my mentor and friend David Banner came out to support! In January, my friends and family helped me bring in my 30th birthday and build community! We raised $1000 for sweaters for students at the Sherman School of Excellence and head phones for the computer lab at the Perspectives High School of Technology. Special thanks to Mr. Makinde Adedapo of Perspectives HS of Technology and Vivian Redwood from Sherman School of Excellence for going the extra mile and organizing this for their students. I had the amazing opportunity of working with America Ferrera on the PeaceFirst PSA. PeaceFirst is a national nonprofit organization that exists to create the next generation of peacemakers. They invest in children’s ability to see themselves as natural problem solvers, creative thinkers and leaders. Peace First gets some Love from MTV.com! I was glad to see this spot that I produced during the 2012 Olympics. 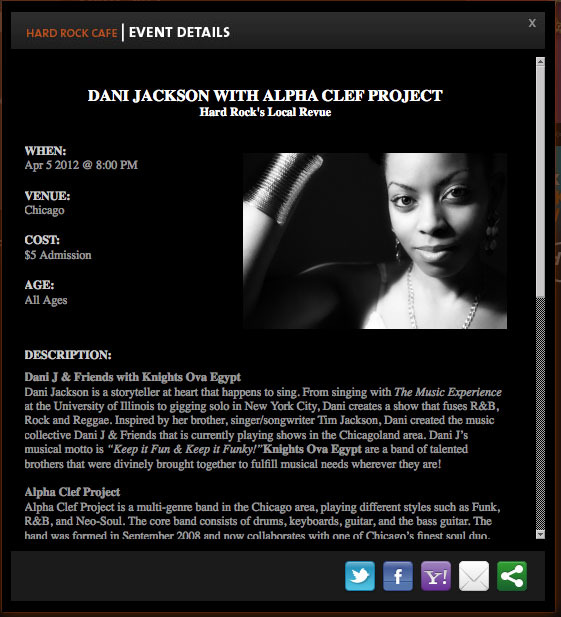 Dani Jackson w/ Alpha Clef Project Tonight! I sing background for Alpha Clef Project.. We had a blast at Double Door in March. I always look funny in pics where I am singing..
Purina Spot I Produced Gets Good Press! This was a great campaign to work on. Shout out to my Purina Team, White House Post, Carbon and all the GREAT dogs!